This season of Gotham is based on a real game-changing Batman storyline. So, what does that mean for the show? Look, it's pretty safe to say that Gotham City has had its fair share or problems. Between the full-scale terrorist attacks led by masked lunatics to your everyday bank robberies and high-speed chases, there's a ton of risk involved in living there, even with Batman around (or not, as is the case on Gotham). But poisoned water supplies and killer escape room-style puzzles cropping up on every block are only the tip of the iceberg when it comes to catastrophes in this infamous comic book city. 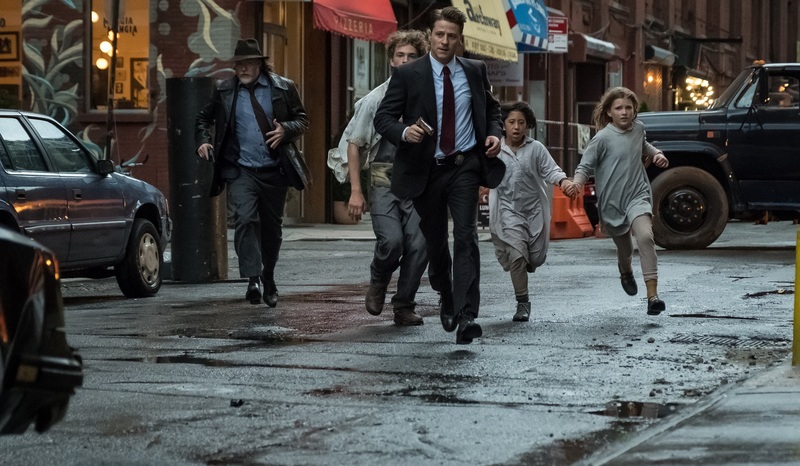 This year’s final season of Gotham fittingly takes its inspiration from what’s got to be considered the granddaddy of them all. Oh yes, Gotham fans, it's time to talk about No Man's Land and what the classic comic book storyline may mean for the series. There's a good chance you've heard of it in one way or another, but just in case, here are the basics. BATMAN: NO MAN'S LAND was, officially, a year-long crossover event between all the ongoing Batman titles that took place in 1999. We’re talking BATMAN, DETECTIVE COMICS, NIGHTWING, BATMAN: SHADOW OF THE BAT, ROBIN, CATWOMAN, AZRAEL: AGENT OF THE BAT…all of them. As a result, it’s not an easy storyline to revisit. It’s out there, in both print and digital formats, but it’s long and complex. For that reason, a TV show may actually be the best format for adapting No Man’s Land since television also lends itself to multiple storylines focusing on various characters that take place at the same time. Citizens of Gotham were given an ultimatum—either they could get out and leave their homes behind, or stay and suffer the consequences. As you might imagine, most left, but there were a few notable exceptions—namely the majority of the Bat-Family, along with Commissioner Gordon and his GCPD officers. Of course, Gotham’s many super-villains decided to stay as well. Because of course they did. With Gotham City officially declared a lawless free-for-all, it became...well, a lawless free-for-all. Much like we’ve seen on Gotham, gang warfare promptly took over, dividing the wreckage into territories with big name villains and petty criminals aligning themselves for control, and the heroes and police officers that remained forming their own rival gangs to push them out. With the majority of the infrastructure still in shambles due to the Cataclysm, things like food, shelter and electricity became hot commodities in some areas. In other words, Gotham City became its very own personalized post-apocalyptic wasteland. Like with any big, long-running event, some parts of No Man’s Land were stronger than others. Yet, longtime Batman readers seem to have a particular fondness for it. So, the real question we should ask is: What was it about No Man's Land that made it so special? Why is it an event we still revisit and pull inspiration from today for shows like Gotham and movies like The Dark Knight Rises? The answer to that question actually lies in what No Man's Land created, rather than the city it destroyed. It may have been a near impossible challenge for most people to navigate through the wreckage of their city, but it also provided a fantastic opportunity to showcase the very best of what Gotham had to offer, even in the absolute worst possible circumstances. Stripped of all semblance of order, heroes like Barbara Gordon were able to step in and take control in what became a defining moment for her newly established identity as Oracle. She set up a base of operations in the Clocktower and coordinated the efforts of the remaining Bat-Family team alongside the scrambling GCPD to maintain the safety and security of the civilians that were unable to evacuate. Helena Bertinelli came to learn what it really meant to be a member of a team with a code to live by. Jim Gordon was forced to adapt his leadership to the now lawless Gotham, transforming the GCPD into a "gang" in their own right that was vying for territory against some of the city's most terrifying criminals. What might have been the end of Gotham City as we know it wound up being a series of new beginnings, galvanizing both heroes and villains alike to transform the city into something more familiar to fans today. Which, if you think about it, makes No Man’s Land the perfect storyline to end a series like Gotham with. No Man’s Land resulted in a reinvention of the city of Gotham, with changes made to many characters that are still in place today. For a series about the origin of Batman and his most famous allies and rogues, a defining event like No Man’s Land can be an entertaining way to get those characters to where they should be when Bruce puts on the cowl. Sure, it was painful in the comics, and not everyone made it through to the other side. Expect it to be on the show as well. But at the end of the day, a year's worth of chaos and carnage only served to prove that the heart and soul of both Gotham and the people who live there are greater than the sum of their parts. Honesty, I can’t think of a better note for a series like Gotham to end on. And with Bruce at long last taking the crucial step of becoming Batman before it’s all through, Gotham’s days have never felt brighter, or its knights more dark. Gotham airs Thursday at 8 p.m. (7 p.m. CST) on FOX.